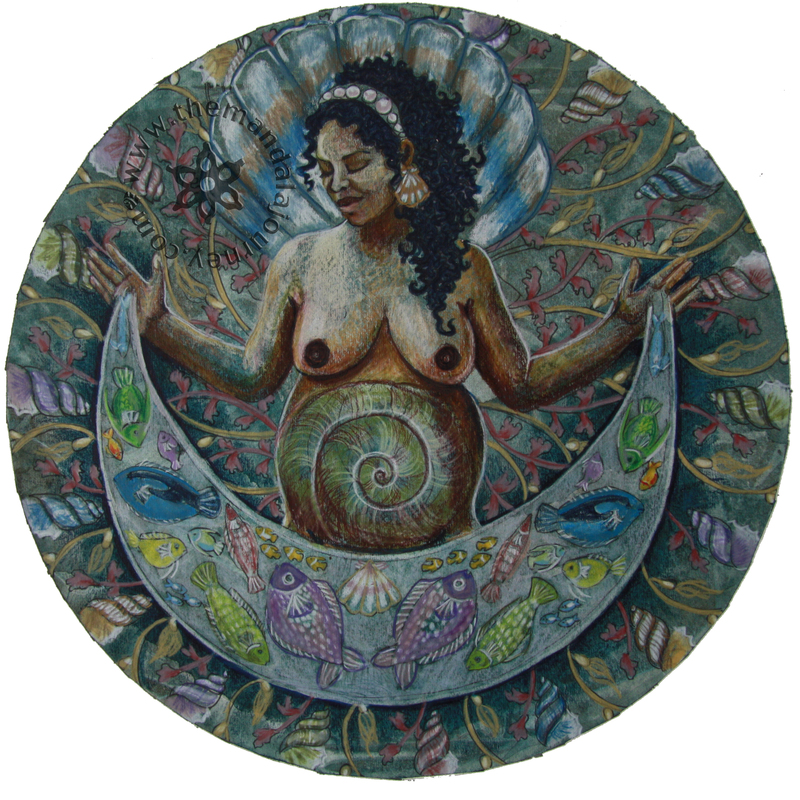 Yemaya is the Yoruban Orisha or Goddess of the living Ocean, considered the Mother of All. She is the source of all the waters, including the rivers of Western Africa, especially the River Ogun. Her name is a contraction of Yey Omo Eja, which means “Mother Whose Children are the Fish”. When her waters broke it caused the great flood that inundated the world and created the seven seas. She then gave birth to fourteen powerful orishas. According to legend, Yemaya is the mother of all life. As all life is thought to have begun in the Sea, all life is held to have begun with Yemaya. She is motherly and strongly protective, and cares deeply for all Her children, comforting them and cleansing them of sorrow. She is said to be able to cure infertility in women, and cowrie shells represent her wealth. It is said when you hold a conch shell to your ear you can hear her voice, which is why I put a cross section of a shell in her belly. She does not easily lose Her temper, but when angered she can be quite destructive and violent, as the Sea in a storm. 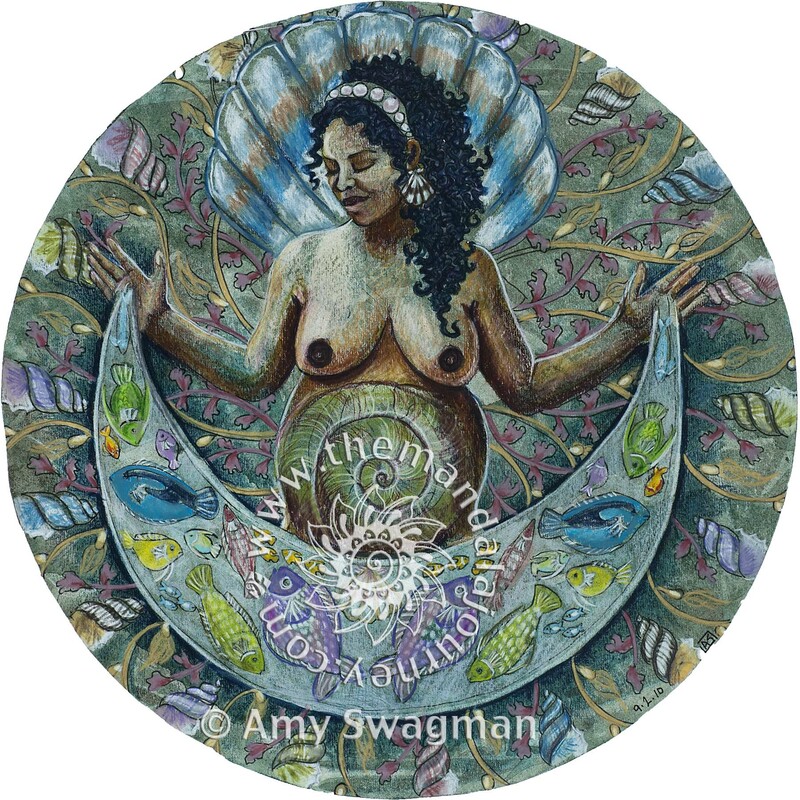 As a Priestess of Yemaya, I really feel your artwork is worthy of our Divine Goddess!